“The book, Tarbiyat us Salik is the khanqah (zawiya) of Hakim al-Umma Mawlana Mohammad Ashraf ‘Ali Thanawi (may Allah have mercy on him)”. Sayyidi wa sandi Mawlana Mohammad Taqi Usmani sahib (Allah preserve him and allow us to benefit from him abundantly. Ameen! ), advised an individual to make a habit of reading from this book daily. It is a fact that in Indian subcontinent (like other areas of the world today) most of the Tasawwuf had become a potpourri of ritualistic traditions and cultural customs of singing, dancing, recitation of litanies & specific ways of remebrance (zikr), celebration of annual anniversaries and a business of charms/amulets (ruqya/taweez), etc. The reality of Tasawwuf, that is to rectify one’s inner morals characteristics so that eventually the outer forms of worships are also performed correctly, and a very strong relationship with Allah is developed had been eclipsed. Hakim all-Umma was a very organized person and had extremely systematic approach for those approaching him for their spiritual training (tarbiyat/islah). For this he had set rules and regulations. One of the rules was that all the discussion regarding this tarbiyah will be in writing. ‘Tarbiyat us Salik’ is the compilation from these letters of disciples along with the reply of Mawlana Ashraf Ali Thanawi. They were selected by Hazrat ra himself and arranged in the specific manner described below. The first two parts were published while Hazrat ra was alive. The third part was published by Mawlana Khair Mohammad Jahlinderi ra (his senior khalifa, founder of Khairul Madaris, Multan) after Hazrat ra’s demise. Alhumdulillah, the literature of Tasawwuf is indeed filled with splendid collections of correspondence of Sufi Shuyukh with their disciples. For example, the famous Maktoobat e Imam Rabbani ra (Mujaddid Alif Thani Sheikh Ahmed Sirhindi ra), Maktoobat e Masoomiya, Maktoobat e Sheikh Yahya Muneri ra, Letters of Ibn e Ibbad al Rundi, Maktoobat e Qudusiya of Sheikh Abdul Qudoos Ghangohi ra, etc. However, the things that makes ‘Tarbiyat us Salik’ unique is that it has both the question, that is, the details of the disciple’s state/behavior/thoughts, etc. and Hakeemul Ummat’s reply alongside. Just like a medicine textbook with signs and symptoms of the sick and diagnosis and treatment for that particular disease from the expert physician side by side. The definition of all the blame/praise worthy traits are well described in classic Sufi texts (for example; Ihya ul Uloom of Imam Ghazali ra, Quwat quloob of Abu Talib Makki ra, Kashful Mahjoob, ‘Awaraful Ma’arif, etc.). The difficult task is to apply this information on one’s behavior. For example, kibr (arrogance) may manifest in several different ways. Making the matter complicated is the fact that sometimes the afflicted individual in not even aware of it and thinks himself to be mutawadh (humble). Someone may sit on the ground in periphery attending a religious assembly. But in his heart he thinks that he deserved the center stage spot and only due to his humbleness he took this awkward spot. This is pure kibr! Thought of being the center of attention never enters the mind of a humble person. Similarly a religious scholar or person of distinguished standing in the community may find it below his status to mingle among the common people and do minor house hold chores. Most of this is due to kibr. Seeing a colleague prosper and become famous may stir feelings of envy (hasad) and wishing bad to happen to him (haqad). This may manifest by ignoring him or back biting him. Moreover, sometimes outwardly an action may look blame worthy but in reality it may not be the case. For example; being angry on someone for a legitimate reason. Etcetera, etc. These are every day scenarios for all of us. They are the reflection of our moral traits. The rectification and reformation of these moral characteristics is very issue of discussion and reformation in Tasawwuf. Tarbiyat us Salik is the exposition of this information. The disciples writing these letters come from a very diverse background. Many were religious scholars, some physicians, some other professionals/government servants and few lay people. This makes the information more useful for all. For a serious reader of Tasawwuf (who is traversing sulook under the guidance of a Sheikh) Tarbiyat us Salik gives an insight on the reality & essentials of Tasawwuf, the sign and symptoms to look for blame/praise worthy moral traits, understand the pathology causing them and finally understand the science and arts of treating it effectively. In short it is an indispensable book for any serious seeker treading the path of Tasawwuf. Seeker wrote: I became a mureed of respected (Sheikh) Mawlana XYZ, and remained in this group for a while. However, now the situation here is very ominous. May Allah SWT have mercy (on us). Kashaf (unveiling) is considered so absolute that actions are carried out according to it. Mureedeen are questioned if they had any kashaf. Deobandi’s are considered to have corrupted beliefs. There is qiyam in mawlid with few people reciting the salaam in unison. In annual function of the maderassa, flowers are distributed. A person has kashaf (unveiling) and it is said that holy Prophet salallaho alhey wasalam is here. He salallaho alhey wasalam gathers them and puts them in his lap. A person who is among the favorite disciples of Mawlana does not pray (salah). In regards to him it is said that he is flawless except one deficiency that he does not pray. These are few examples. I do not want to waste your time by telling more. I have withdrawn from them completely. 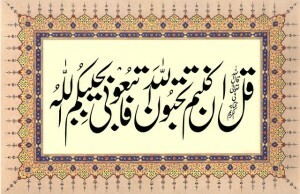 I recite the ism-e-zaat (supreme name, i.e. Allah) as much as possible. However, I need your special assistance. Please, make me your mureed. I will do as instructed. Once you acted hastily and are now regretting that. Do you want to repeat the same mistake? Therefore, do not hurry in becoming a mureed. The best thing will be to stay with the selected Sheikh for a couple of months. After wholehearted satisfaction request for bayiah be made. At that time if the Sheikh also feels approval in his heart, he will accept. Otherwise in case of his excuse, stay with him should be prolonged further. Having best hope from Allah SWT, by doing such Sheikh’s refusal will not be protracted. The bliss and benefit of this bayiah will be exceptional. Furthermore, it is grossly wrong to follow (and become a mureed of) whomever you come to know of. A Seeker wrote:Now the only source of misery at home is the condition of younger brother. It is the same as it was. I pray for him daily, asking Allah SWT that he gives up the habit of lying and embezzlement. These two are usually the cause of most of the suffering. He is destroying both, his religion and worldly life. I request you to pray (make dua) for him and advice any practical solution to achieve this. Hakeemul Ummat ra replied:I have no hesitation in making dua for him. And that happens when even after substantial efforts other do not pay heed. (A sufi does not attain purity until after a toil and struggle. Topic: Tasawwuf. In particular tarbiyat e batini (spiritual training) of mureedeen. This entry was posted in A. Reality of Tasawwuf, L. Books on December 31, 2008 by 'abd.